Capsule wardrobes are all the rage now, and for good reason: These compact collections of carefully selected staples will cut the clothing clutter while allowing you endless mix-and- match outfit options. Shoes are such an important part of a stylish wardrobe because, like accessories, shoes can elevate a look from “hmmm” to “whoa!” For a capsule wardrobe, the right collection of shoes can provide endless options for building outfits. As you’re building out a capsule wardrobe (or just trying to get control of your shoe closet), consider these guidelines. Capsules tend to be seasonal, and this article focuses on a fall/winter shoe capsule, but the same principles would apply for any season. 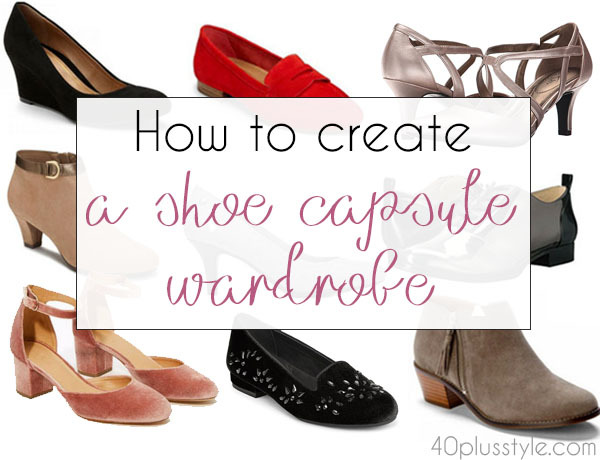 Building a shoe capsule wardrobe is fairly straightforward. First, understand the basic categories of footwear and determine which represent how you dress. 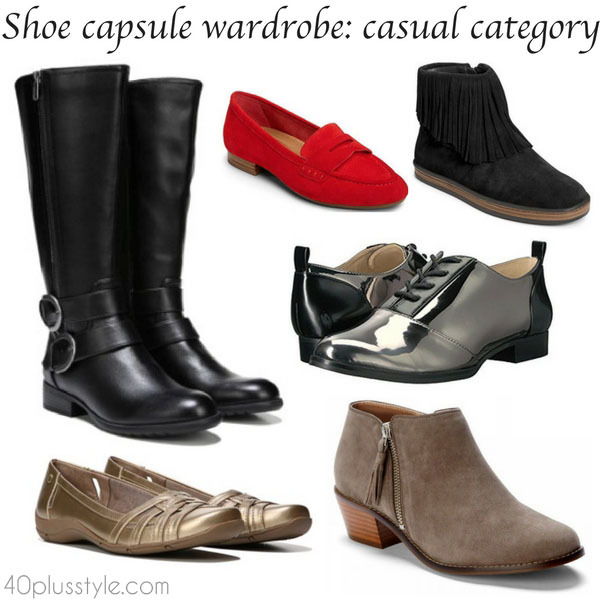 As you build out your shoe capsule, you’ll ignore categories that don’t correspond to your lifestyle. Professional. These are shoes for work, whether you’re a lawyer who needs a collection of pumps or a police officer who depends on heavy-duty loafers. Casual. Between businesswear and beachwear lies your casual wardrobe. Beyond that, you define what casual means to you — and select your casual shoes accordingly. Leisure. Capri leggings with a tunic-length hoodie, anyone? Not to be confused with casual, leisure clothing delivers maximum comfort — but not at the expense of head-to- toe style. Dressy. These are the shoes that add sparkle to your wardrobe, sometimes literally! They make appearances for special occasions, such as a romantic anniversary dinner or holiday party. Special purpose. This “miscellaneous” category includes all footwear that meets specific, non-fashion needs. We’re talking fitness shoes, gardening boots, house slippers, and the like. Throw in a couple pairs of flip-flops here if you must. Don’t count these in your shoe total. Once you identify the categories of shoes you wear, it’s time to determine how many pairs to include in each. Remember, this is a capsule wardrobe, so the goal is to pare down and simplify. Aim for 10 pairs total. You want your final shoe capsule to correspond, proportionately, to how you dress. Do you spend most of any given week in professional attire? 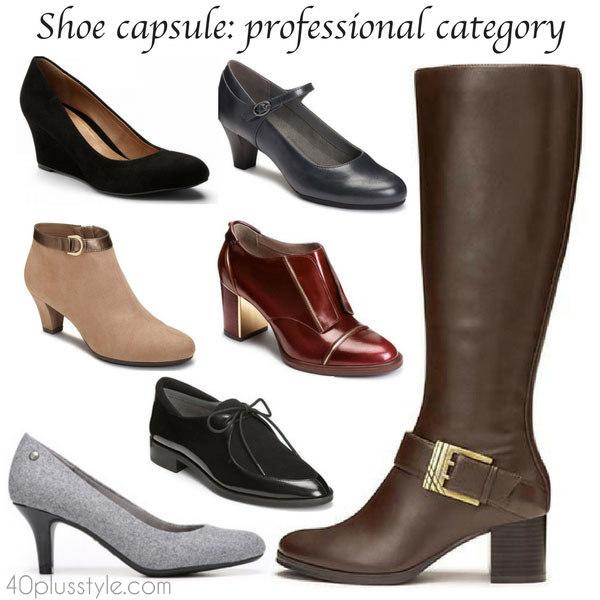 If so, you’ll typically want professional shoes to comprise half of your shoe capsule, or 5 pairs. Divide the remaining 5 pairs among the remaining categories as you find appropriate — for example: 3 casual, 1 leisure, and 1 dressy. So: 5 + 3 + 1 +1 = 10 total. The formula is a starting point; it won’t work for everyone. For example, if you really only need a few pairs of work shoes and love to express your style through fun weekend wear, then by all means go for a mix that emphasizes casual options. And, even if you sport athleisure attire 90 percent of the time, you might not want 9 out of 10 pairs of your shoes to be leisure shoes. go. Remember, capsule wardrobe pieces need not be plain! Whether clothing or shoes, if you acquire highly versatile pieces you love, mixing and matching will come easily. The images that accompany this article provide suggestions by category. one or the other). Those are the shoes that will go the extra mile in a shoe capsule wardrobe. Select some shoes that work in more than one category, such as classic pumps or loafers that could double as professional and casual wear. Think about wearing a pair of sneakers with a skirt, or a pair of dressy pumps with jeans and a blouse. Emphasize solid, neutral colors that complement your capsule wardrobe — black, gray, navy, brown, tan — but be sure to include a few bold colors, classic prints (such as leopard or polka dots), and metallics that reflect your style, as long as they can be worn in versatile ways. 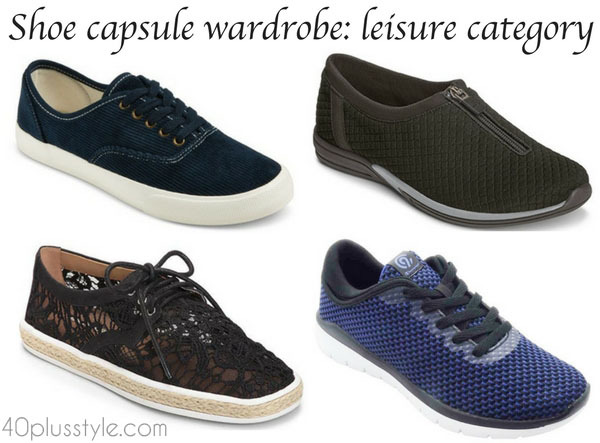 While you might be able to get away with a few pairs of uncomfortable shoes in a typical shoe wardrobe, such is not the case with the shoe capsule, where every pair should be a workhorse. Avoid pointy-toed styles, heel heights outside your comfort zone, and the temptation to buy that pair on sale that doesn’t quite fit. Use this shoe capsule exercise to identify areas to expand your style horizons. If your shoe wardrobe is primarily sneakers and slip-ons, that could be a signal to branch out. Give yourself a nudge toward a cute-but- practical pair of Mary Jane flats or even a low wedge heel! And although practicality is a must for many of us, keep in mind that shoes can be a way to have some style fun even if you’re fashionably conservative above the ankles. Is the shoe capsule wardrobe for everyone? Absolutely not! In fact, for many women, a minimalist collection of shoes is downright unimaginable. 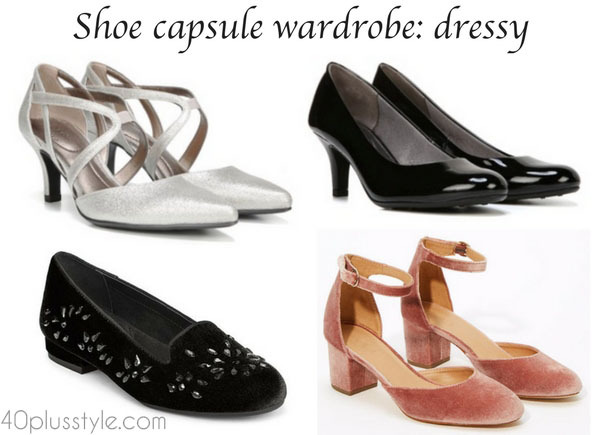 But if you’ve already embraced the capsule wardrobe concept, a shoe capsule could be the next logical step. 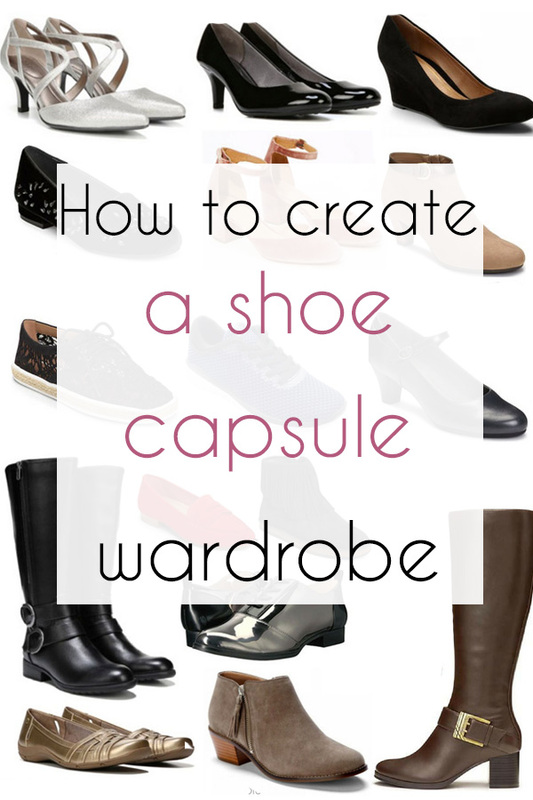 Do you like the idea of a shoe capsule wardrobe? What shoes would you add? 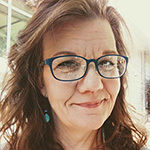 Nancy Spurling Johnson, based in Eugene, Oregon, U.S.A., is a 50-something writer/editor, wife, and mother to twin young men and a chubby old pug. She has a big appetite for travel, movies, audiobooks, humor, and cheese. Great article. I never thought about a shoe capsule. This makes so much sense, and although I like more shoes, this is a wonderful way to make sure I have the shoes I need to cover all my bases. Seems like a good post. I am afraid I am beyond this at the moment. Lost track of how many pairs I have, but I do know what I have and 95 out of 100 times I know where I put them. Next post: 14 dinner party outfit ideas you will love – Which one is your favorite?